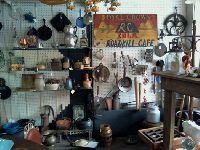 If you are looking for those old utensils that grandma used, chances are pretty good you can find them at Vintage Treasures. Can't promise the same results from the kitchen as grandma but at least the tools will have the necessary experience. Pictured here is just a sampling of what you will find scattered throughout the store. We are offering Autoclavable Utensils.